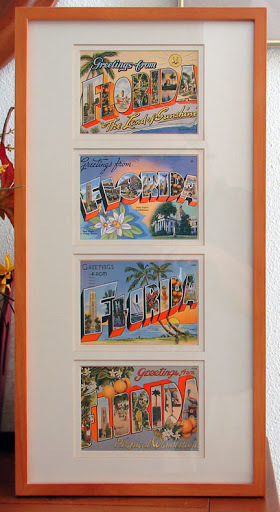 I got a lovely postcard from Hastings, East Sussex today where sis is currently vacationing, and I thought I would share a photo of how I display my favorite vintage Florida postcards. These hang in my front hallway. I am not an avid collector, I just pick up the occasional card here and there when I see one I like. I guess it’s the graphic designer in me! I do enjoy finding vintage cards from places I have actually visited or lived.